EUROPE: Investment in Europe's offshore sector reached €14 billion in the first half of 2016, with the UK contributing most to the total, WindEurope has said. Seven projects reached a final investment decision (FIDs) in the first six months of the year, totalling 3.7GW, the trade body said in its H1 report. The investment total is the highest amount yet, and has supported more than double the capacity that arranged financing in the first half of 2015. Four countries in Europe contributed to the investment sum. 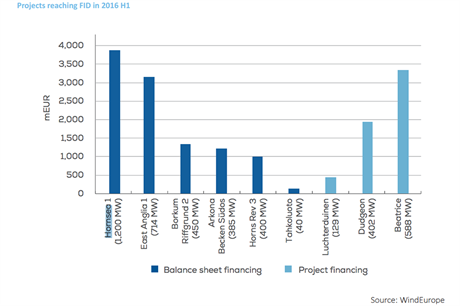 FIDs for projects in the UK made up three quarters of the total with over €10.3bn supporting 2.5GW of offshore capacity. The largest of these was Dong Energy's FID at the 1.2GW Hornsea Project One site, off the UK's east coast. The project – the world's first 1GW+ site – is due online in 2020. The 588MW Beatrice, 714MW East Anglia 1 and 402MW Dudgeon sites were also financed in the first half of the year. The 450MW Borkum Riffgrund 2 and 385MW Arkona site were financed in Germany, totalling €2.5 billion. While the €1bn 400MW Horns Rev 3 project in Denmark was given the go-ahead by its developer Vattenfall. Finally, the 40MW Tahkoluoto site in Finland completed the European total in the first six month of the year. New grid-connected capacity was down 78% compared to last year at 511MW, WindEurope said. European offshore capacity stands at 11.5GW. "The record investment numbers show a clear industry commitment to offshore wind. We expect installations will pick up significantly in 2017 but there are a lot of challenges out there still on offshore wind," said WindEurope CEO Giles Dickson.